Valiant Entertainment - BN Licensing B.V. 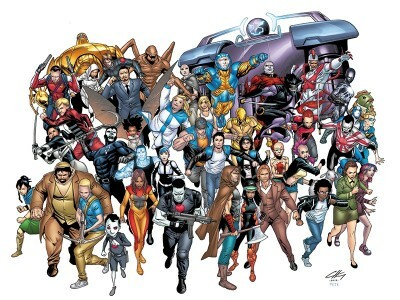 Celebrating its 25th anniversary in 2015, Valiant is one of the most successful comic book publishing companies in the history of the medium with a library of more than 2,000 distinct characters, including the best-selling superheroes Bloodshot, Harbinger, X-O Manowar, Shadowman, and Archer & Armstrong, among many others. Established by a brain trust of legendary comics creators, Valiant’s heroes and villains inhabit the largest independently owned superhero universe anywhere in comics. The Valiant Universe is characterized by a grounded, characterdriven approach to storytelling that spans multiple genres and offers a contemporary and diverse take on superheroes. Its characters inhabit a shared universe only subtly removed from our own—one inspired by real-world science and inhabited by morally ambiguous heroes that often forgo capes and secret identities. From the dawn of civilization with the Eternal Warrior to the orbiting nations of the 41st century in Rai and beyond, the stories of the Valiant Universe span millennia, where decisions made at the dawn of time ripple into the distant future and today’s heroes can be tomorrow’s villains when the hard choices are made. ™ & © 2018 Valiant Entertainment LLC. All rights reserved.